“I hear time and time again from Black Americans who traveled to Africa about how connected they felt and how different they found whatever country they traveled to from the images of Africa they grew up with,” said Roman Debotch, owner/contributor of the site Black Excellence. Maya Angelou The Transatlantic Slave Trade started with slave ships, whips, chains and a most demonic kind of evil: Europeans and others hunting down Africans like animals. The result: an estimated 12 million enslaved Africans were shipped as cargo across the Atlantic Ocean to the Americas between the 16th and 19th centuries – and, according to the Encyclopedia Britannica, that figure represented just one stage of the slave trade. Today, as the world takes note of the anniversary of the slave trade [500 years for some, 400 for others], a rousing call to Africans throughout the diaspora has gone out. “Everyone agrees that all that is needed for Africa to take her rightful place on the world stage is for her children to come back home,” said Her Excellence Dr. Arikana Chihombori-Quao, the African Union Ambassador to the United States of America. Ghana’s President H.E. Nana Akufo-Addo, has reportedly planned a number of events for 2019 in commemoration of the anniversary of the transatlantic slave trade. 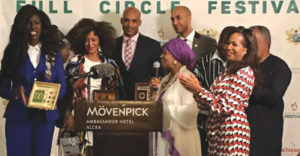 The commemoration began with the “Full Circle Festival” which brought numerous celebrities and others who visited historical sites and attended a breakfast hosted by the president. “This celebration of ‘Coming Home’ is one that should be encouraged and promoted across the global black community,” said Roman Debotch, owner and contributor of the website, Black Excellence, a platform used to shed light on noteworthy achievements in the Black community. “In 2019, we are still learning about our origins. Crimes are still being labeled ‘the worst in history…’ and none of those statements end with ‘transatlantic slave trade.’ The invite home is a way for me to support my brothers and sisters.